(Nanowerk News) University of Pittsburgh researcher Alexander Star and colleagues at a California-based company, Nanomix, Inc., have developed devices made of carbon nanotubes that can find mutations in genes causing hereditary diseases, they report in the Jan. 24, 2006 issue of the journal Proceedings of the National Academy of Science. 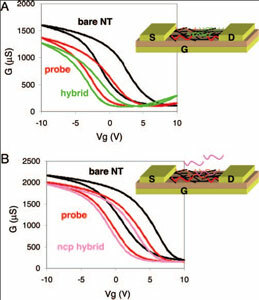 The researchers report carbon nanotube network field-effect transistors (NTNFETs) that function as selective detectors of DNA immobilization and hybridization. NTNFETs with immobilized synthetic oligonucleotides have been shown to specifically recognize target DNA sequences, including H63D single-nucleotide polymorphism (SNP) discrimination in the HFE gene, responsible for hereditary hemochromatosis. The electronic responses of NTNFETs upon single- stranded DNA immobilization and subsequent DNA hybridization events were confirmed by using fluorescence-labeled oligonucleotides and then were further explored for label-free DNA detection at picomolar to micromolar concentrations. The researchers have also observed a strong effect of DNA counterions on the electronic response, thus suggesting a charge-based mechanism of DNA detection using NTNFET devices. Implementation of label-free electronic detection assays using NTNFETs constitutes an important step toward low-cost, low-complexity, highly sensitive and accurate molecular diagnostics. The observed changes in NTNFET electronic characteristics can be correlated with DNA detection. The results were confirmed by using fluorescently labeled DNA compounds that verified that DNA adsorption and hybridization were selective for nanotubes. Although sensors with only a few (and ideally with a single) carbon nanotube sensing elements can be fabricated, sensors used in this study contain a random network of nanotubes, covering a relatively large surface area between two metal electrodes. The random network geometry has several advantages: it eliminates the problems of nanotube alignment and assembly, eliminates conductivity variations due to nanotube chirality and geometry, and is tolerant to individual SWNT channel failure because the device characteristics are averaged over a large number of nanotubes. In addition, such devices can be developed on low-cost flexible and or transparent polymer substrates by spray deposition or casting of nanotubes from solution.